48 GAMES SLAPS SHOOTER'S FUN ZONE ILLUSTRATIONS BY Mike Curti NOVEMBER. 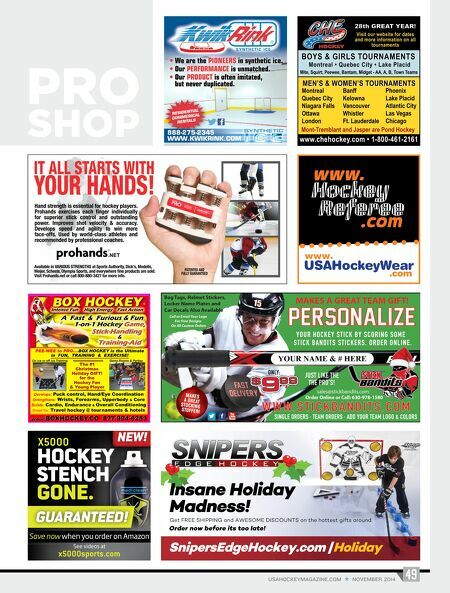 2014 USAHOCKEYMAGAZINE.COM Sticklers By Mike Curti DID YOU KNOW? Andy Brown of the Pittsburgh Penguins was the last NHL goaltender to play without a mask when he was between the pipes on April 7, 1974. Brown retired from pro hockey after the 1976-77 season. FUNNY PHOTO WINNERS • "Can you find the manual for this thing?" Todd Jenkins San Bernardino, Calif. • "When I asked for nasal strips, this isn't what I had in mind." Josh Rock Sauk Rapids, Minn. • "I guess one size doesn't fit all." 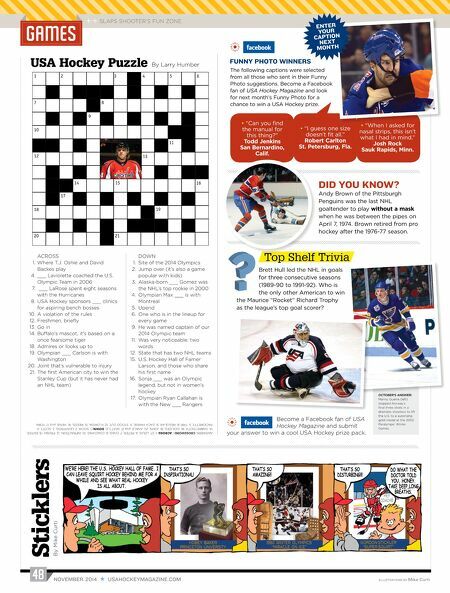 Robert Carlton St. Petersburg, Fla. USA Hockey Puzzle ANSWERS: CROSSWORD | ACROSS: 1. ST. LOUIS, 4. PETER, 7. CHAD, 8. COACHING, 10. INFRACTION, 12. FROSH, 13. ENTER, 14. SABRETOOTH, 18. IDOLIZES, 19. JOHN, 20. ANKLE and 21. SEATTLE. DOWN: 1. SOCHI, 2. LEAPFROG, 3. SCOTT, 4. PACIORETTY, 5. TRIP, 6. REGULAR, 9. ZACH PARISE, 11. STOOD OUT, 12. FLORIDA, 15. REEDS, 16. HENIE and 17. YORK. ACROSS Where T.J. Oshie and David Backes play ___ Laviolette coached the U.S. Olympic Team in 2006 ___ LaRose spent eight seasons with the Hurricanes USA Hockey sponsors ___ clinics for aspiring bench bosses A violation of the rules Freshmen, briefly Go in Buffalo's mascot, it's based on a once fearsome tiger Admires or looks up to Olympian ___ Carlson is with Washington Joint that's vulnerable to injury The first American city to win the Stanley Cup (but it has never had an NHL team) 1. 4. 7. 8. 10. 12. 13. 14. 18. 19. 20. 21. DOWN Site of the 2014 Olympics Jump over (it's also a game popular with kids) Alaska-born ___ Gomez was the NHL's top rookie in 2000 Olympian Max ___ is with Montreal Upend One who is in the lineup for every game He was named captain of our 2014 Olympic team Was very noticeable: two words State that has two NHL teams U.S. Hockey Hall of Famer Larson, and those who share his first name Sonja ___ was an Olympic legend, but not in women's hockey Olympian Ryan Callahan is with the New ___ Rangers 1. 2. 3. 4. 5. 6. 9. 11. 12. 15. 16. 17. By Larry Humber Brett Hull led the NHL in goals for three consecutive seasons (1989-90 to 1991-92). Who is the only other American to win the Maurice "Rocket" Richard Trophy as the league's top goal scorer? Top Shelf Trivia The following captions were selected from all those who sent in their Funny Photo suggestions. Become a Facebook fan of USA Hockey Magazine and look for next month's Funny Photo for a chance to win a USA Hockey prize. ENTER YOUR CAPTION NEXT MONTH Become a Facebook fan of USA Hockey Magazine and submit your answer to win a cool USA Hockey prize pack. THAT'S SO INSPIRATIONAL! THAT'S SO AMAZING!! THAT'S SO DISTURBING!!! HEY COACH!!! HOBEY BAKER PRINCETON UNIVERSITY 1980 WINTER OLYMPICS "MIRACLE ON ICE" GORDON STICKLER "SUPER SQUIRT" DO WHAT THE DOCTOR TOLD YOU, HONEY. TAKE DEEP,LONG BREATHS. WE'RE HERE! THE U.S. HOCKEY HALL OF FAME. I CAN LEAVE SQUIRT HOCKEY BEHIND ME FOR A WHILE AND SEE WHAT REAL HOCKEY IS ALL ABOUT. OCTOBER'S ANSWER: Manny Guerra (left) stopped Norway's final three shots in a dramatic shootout to lift the U.S. to a surprising gold medal at the 2002 Paralympic Winter Games.